Villa Taiba. Set in the peaceful area of ArikBasi Dalyan surrounded by mountains providing breath taking scenery and easy access to Dalyan town centre. This luxurious villa has four beautifully furnished en-suite bedrooms (three double and one twin). Private swimming pool, outside Jacuzzi, Kusk (shaded seating area) and BBQ and providing several shaded areas for guests comfort. Villa Taiba is furnished to a high standard. The Iztuzu Beach and lake can be reached by the local dolmus (bus) (bus stop 2 minutes walk away from the villa) or by river boat from the town centre. The villa has three double en-suite and one twin en-suite bedrooms (two travel cots, child seat and sterlizing unit are also available). Air-conditioning throughout. All bed linen, bathroom towels and pool towels are provided. Villa is cleaned throughout every week. Hair dryers are provided in each of the bedrooms for guest comfort. Villa owned by Ausaf & Lyn Syed residing in the UK. We have been going to Dalyan for many years and love the place and the Turkish people. We have made some lovely friends in Dalyan. Peaceful, very comfortable. Surrounded by mountains near to all amenities. Each bedroom has large luxurious en-suite facility. Three of the four bedroom has showers and one room is fitted with a bath/shower. Bathrooms are all finished to a very high standards and provide shaving points. Lounge with internet access free Wifi, large flat screen TV and satellite system, DVD player (lots of films and kids dvd's avaiable). IPod docking station and CD Player/Radio. Balcony terrace with fantastic views over Arik Basi mountains. Watch sunrise. Fully fitted kitchen with modern appliances. Cooker, hob, fridge, freezer, dish washer, microwave, coffee machine, washing machine etc. etc. Seperate dining room is also available for formal/informal dining. Property is not modified to help people with mobility problems. Notes on accommodation: Internet access free Wifi. Air-conditioning through out. Water cooler, Fully equiped kitchen, seperate dining room. Outside: Private pool. Jacuzzi. Outside Shower. BBQ, Outside sink. 8 Sun Lounges with padded cushions , Portable and fixed parasols and Fixed Canopy. Big Kusk (shaded seating area), Outside toilet. Large dining Table with padded cushions (seats 8 people). Fully maintained garden with mature trees ( Lemon, Peach, pomegranate, bananas olive etc.) Cleaning / Towels / Linen / Maid service: Villa cleaned throughout each week. Bath Towels, linen and pool towels supplied free of charge. Any other questions please contact the owners. Stayed at the Villa Taiba for a week. The booking process was first class not a glitch. The owners Ausaf and Lyn couldn’t have been more helpful. Remzi (Mtce Mgr) is first class; very helpful and informative thoughout our stay. The villa has all the mod-conns, decorated well throughout, everything worked. Absolutely nothing to complain about. A beautifully peaceful location, the locals are friendly and helpful. You don’t need a car if your going in and out of Dalyan, it’s a lovely stroll there and back, you meet the locals and see a bit of local life. Surely that’s what travel is all about! This villa was recommended to us and we would certainly recommend to others. A beautiful part of Turkey, no stress, no hassle just a quiet relaxing holiday. Beautiful villa in a very peaceful country location. For two travelling families with young children, the layout of the villa worked perfectly, allowing each family to have a private area each. The facilities were brilliant, and the villa was more "kitted out" than my own home with regards to kitchen equipment, toys for the kids, DVDs, furniture, cushions, towels etc! The property was clean and well maintained, and the agent for the villa was very helpful. I would recommend this villa to my friends and family. Dalyan town was about a 20 minute stroll with the children, but taxis were cheap and readily available. The town had everything you could need! Very nice holiday overall! Booking to stay at Villa Taiba was easy and Ausaf and Lyn are very helpful and informative. The photos really don't do this lovely villa justice, it was beautiful. We had arranged an airport transfer through Ausaf and Remzi - the local agent arranged a smooth airport transfer and then met us at the villa to show us around. The villa has everything, is very comfortable and is home from home. A great bonus was the water cooler and only 5tl to replace and that was delivered. The villa is ideally located near the town but far enough away to appreciate the wonderful fruit orchards and farms near by. We loved the pool and jacuzzi and the outside Kusk was very comfortable to while away the warm evenings in. Dalyan has a lot to offer, we enjoyed a couple of boat trips to nearby bays and to the lake. Lunch was freshly prepared and barbecued on board and was outstanding! We enjoyed the Saturday market offering fresh fruit and veg as well as wonderful spices. The turkish people are very warm and welcoming and the scenery just breathtaking. Top tip is go to the sunset restaurant up the mountain off the road to iztuzu the scenery is amazing and sunsets to die for. They will arrange to collect you and the food is basic but very fresh and so well cooked! If I had to think of any downside it would be that the air conditioning stayed on a little longer in the villa than 1 hour and that we had a maid to clean through after 1 week but having said that we managed by using the washing machine at the villa to wash sheets and towels. We had a fabulous holiday and are booking to go back - we can't wait!! I would definitely recommend! Villa Taiba perfectly located. The airport transfer was effortless - within 30 mins we were at the villa which soon felt like home. 4 equal sized en-suite bedrooms . Effective air conditioning in every room. Kitchen well equipped -Dishwasher & washing machine made life easy. The pool is great, cleaned daily and enjoyed direct sunshine (surrounded by shade for those who prefer it). Pool/beach towels provided. The villa is situated on a small road (only 5 villas & local mosque), surrounded by pomegranate trees & mountain views - idyllic. The town is about 1 mile away along a flat, quiet country road & is a perfect mix of local life & tourism. Saturday market is perfect for fruit and salad, local deli, bakery (bread/baklava) cheese, olives and the "genuine-fake" products. The Turkish massage was a nice treat on the 1st day. Restaurants along the river are more expensive than those in town but worth it. We enjoyed Caretta-Caretta restaurant where 7 of us ate a 3 course meal with wine/beer, inches from the river, directly opposite the tombs (lit at night) - £95. We exclusively hired a boat directly with the captain for an all day excursion that included a tour of hidden coves, local sites, sulphur lakes & beach. We hired the same boat for a midnight cruise visiting the lake, thermal baths and a must-see view of the starry sky from the centre of the lake - both trips including BBQ on board. Supermarkets are open late, great value compared to the UK (new laws prevent the sale of alcohol after 10pm). Migros supermarket excellent and the taxi office next door ideal to get shopping back (10TL to the villa). Perfect holiday/perfect villa - already booked Villa Taiba for 2015. The villa was very well appointed with everything that you would need provided. The villa was clearly a home and not just a rental house which made a real difference. The 4 bedrooms were all equal in size each with an excellent en suite which made it ideal for 4 couples. The upstairs balcony was a lovely place to sit in the evening for aperitifs with a fabulous view over the mountains. The outside of the villa was beautifully kept with paving and flowers all around with a sweet smelling jasmine just by the kush and the pool and jacuzzi were perfect for us. Dalyan itself is very much a town lived in by locals and not just a tourist area and the best aspect is gained by walking by the river and from a boat. We had a really good day out by having a boat to ourselves which included a lovely lunch as well as seeing the turtles/mud baths etc at our own pace (Captain Ali). The transfers to and from the airport and organisation of trips was excellent with the managing agent appointed by Ausaf (Remzi) being friendly and helpful. Overall everybody we encountered was extremely friendly - you just have to be firm but polite when walking by the boats because of the sales pitches but there is a lot of good humoured banter! Mordern Spa offering very good facilities including massage, suana, Steam room, turkish bath and various beauty treatments. Mud bath an expierance not to be missed. Boat trips/ Moon light cruise, 12 island tour. kaunos ancient city ruins offering specticle view over Dalyan. The Iztuzu Beach and lake can be reached by the local dolmus bus (Bus stop 2 minutes walk away from the villa) or by river boat from the town centre. Iztuzu beach is also called the turtle beach - where turtle lay eggs in matting season. Iztuzu/turtle beach is shape of a horse shoe and can be walked from one end to the other- quite an enjoyable walk and finish with a pancake and an efes (beer). 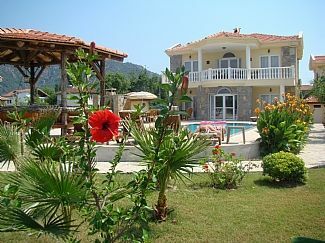 Nearest airport Dalaman. Driving distance from villa approx. 30/35 minutes. Car hire available in Dalyan. Local Taxi very cheap and readily available. Boat trips a must. Easy access to the Dalyan town centre. Booking Notes: Please contact owner. Changeover Day: Please contact owner. Notes on prices: Discounts are available for early booking of 2015 and 2016. Book early to obtain maximum discounts and confirm the holiday dates that you require. £150 deposit (per week) is payable on confirming the booking and the balance of the holidays is payable 8 weeks before departure. WIFI, VPN and push bikes are now avaiable free of charge for guests use.